Having the right tools for the job is often an essential among artists, especially those working at a certain level, and along that same vein, having the right palette can make all the difference not just for convenience, but for achieving certain moods and even surface qualities in your work. Please note that some of these colors vary significantly from brand to brand. Many of these color/brand combinations were just what I could pick up at my local Jerry’s Artarama, but if a specific brand/color combination is essential I’ve marked it with an asterisk. I do not use black on my palette, as I’ve found I can achieve a deep jewel-like black by mixing ultramarine blue deep and transparent oxide brown. Start by breaking the habit of thinking of your paint as a precious resource that must be rationed. The last thing you want is to interrupt a focused painting session because you put out only tiny daubs of paint. Now, as you get more comfortable with your workflow you may learn that you never need that much cadmium red or terra rosa, so don’t be afraid to cut back on those colors to avoid wasting paint. But only after you have broken the habit of being stingy with your other colors. This minimizes contamination by maximizing the available surface area to pull paint from. In a blob any time you dip your paint in, there’s a good chance your brush will touch a portion that’s already contaminated with another color. One technique I learned about early on came from Casey Baugh, who learned from Schmid but nonetheless has a much different approach to his palette. Instead of focusing solely on the hues available to him, he works with a slightly more limited palette and instead thinks about his paints in terms of being light versus dark. On the light side he has the high value primaries + orange (cadmium yellow light, cadmium orange cadmium red, and king’s blue in addition to titanium white, which is considered to fall into the blue family), and on the dark he has the low-value analogues (yellow ochre, alizarin permanent, ultramarine blue deep, and ivory black, which again falls under the blue umbrella). Finally, a couple of convenience colors (transparent oxide red and viridian) are added on the dark side of the palette. 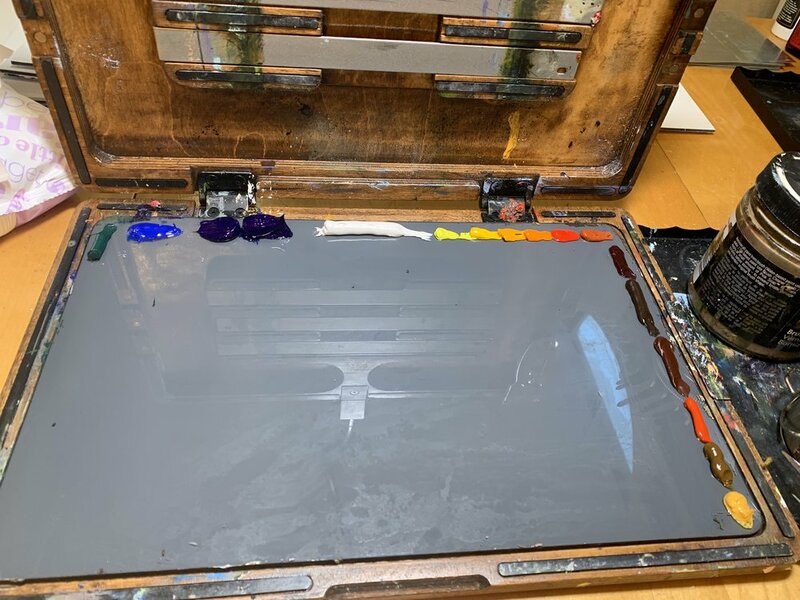 Baugh also works on a glass palette that has two sheets underneath: one light neutral gray sheet under the light paints, and a dark neutral gray sheet under the darks. This helps to inform his color mixing a bit more, particularly in terms of keeping the values accurate. By dividing the palette this way and working mainly with high-chroma paints, Baugh has the capability to mix just about any color. ** If he knows the value is dark he’ll choose primaries from the dark half of the palette. If it got too dark he won’t add white - he’ll simply introduce some primaries from the light half. To learn more about Baugh’s palette and approach to color mixing, I highly recommend you stay on the lookout for any rerelease of his oil painting workshop videos. Currently I arrange my palette by temperature. This helps me to keep my colors vibrant and intentional (no accidental muddiness) because I’m less likely to nick my brush into a color of the opposing temperature while picking up the paint I actually want. While I’ve never rearranged my paint layout based on this, I do like to think of each color in terms of its opacity. One thing I noticed very early in studying the Putney Painters’ work was the strategic use of transparent colors early in the painting process. This makes a great deal of sense when you’re talking about transparent washes, but one thing I hadn’t considered was the jewel-like quality that transparent paints have when applied as an early layer, even without medium. Now, this isn’t a hard and fast rule — I often see that Schmid would start his pieces with Viridian in the initial wash, or even some cadmium. But analyzing his works to seek out these patterns still helped me gain quite a bit of confidence when it came to implementing those techniques in my own work. I often reach for my opaque paints later in the painting process, and try to do the same with white as it can create a chalky color quality to the piece if you aren’t careful with your paint placement. I’ve found that early washes of transparent paints tend to do very well with soft or synthetic brushes, while opaque sections (especially those with a lot of titanium white) are more manageable with a stiffer bristle brush. There are many schools of thought on this, even from painters who work in the same style, but a final item I wanted to touch on is pre-mixing and palette cleanliness. I won’t dive too deep into this, but rather than pre-mixing some paint colors to keep on the palette, I try to keep my palette as clean as possible (not that you’d know by some of my process shots). With color mixing like painting generally, I find the largest obstacle is dissociating ourselves from semantic labels we place on our subjects. For instance, a ‘brown’ tree that’s actually a warm gray, or grass that’s actually much more yellow or brown than we think it is. I’ve found that pre-mixing colors makes us prone to thinking this way, i.e., mixing a single ‘skin color,’ that can lead to a portrait that can be a bit more flat or dull than you wanted it to be. More often than not colors that occur throughout a painting that feel identical are subject to influences that we have a difficult time noticing. As a result my preference is to try and constantly challenge myself to analyze the color of each stroke I want to put down, and that can be difficult to adhere to if you’ve given yourself a shortcut. Additionally, if you aren’t regularly scraping your palette clean you’ll find that it becomes more and more challenging to mix high-chroma colors, and your painting can turn out muddy. Just because you have your ideal palette does not mean you can make any color your eye can perceive. By and large, you should be able to mix any color that’s not fully saturated — the only colors that may elude you are extremely vivid colors. You can always mix to lower the chrome, but you won’t be able to achieve higher chroma than the tube produces. As a result, some very bright flowers or other high-chroma subjects may require that you sacrifice having the exact right hue in order to find a similar color that has the same intense payoff.